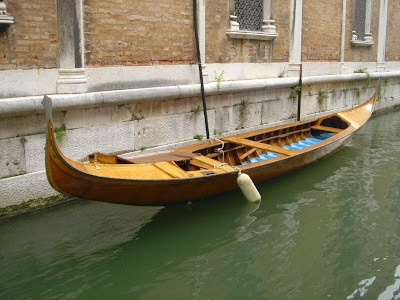 In September of 2000, during a visit to Venice, I saw this boat for the first time. We had arrived at night and only saw a few standard gondolas on our way to the apartment that would be our home for the next week. I woke up early the next morning, made some coffee, stepped out on the balcony...and saw this boat. Unfortunately, I didn't have my camera handy, and by the time I found it, the boat was gone. I've seen many similar boats since then, but this one was easily recognizable, even six years later. When I stumbled upon her in 2006 at the edge of Campo Santo Stefano near the Accademia Bridge...I had my camera, and took these shots. Venice is full of beautiful black gondolas, waiting to have their pictures taken, but wander around a bit, and you'll see lots of other interesting and eye-catching vessels. To be honest, I'm not entirely certain of the boat's classification. 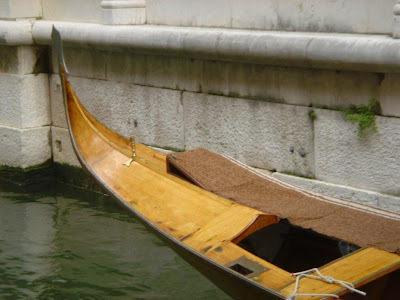 She looks like a Balotina, but with traditional gondola rails and trasto da prua. In many ways she also reminds me of a shorter version of some of the big "desonas" we see in some of the rowing clubs. If one of my readers would like to offer a more accurate name - please, post a comment. 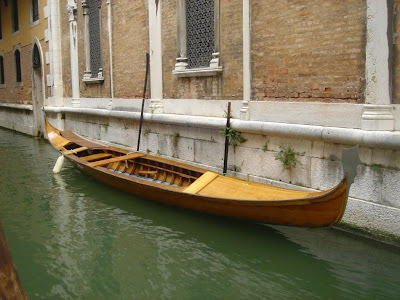 Until then, I'm calling her a "fully varnished gondola". Maintaining a boat with paint is one thing, keeping a boat up in varnish is much more difficult. Any wood discoloration is completely visible. There's no forgiveness, no hiding stuff. All the varnish in the world won't cover up a rotting corner or other imperfection. If you look at the stern of the boat, you'll see a few dark spots. Take another look, specifically at the caenelo (that vertical piece next to the carpet), and you'll see "1971" carved in the wood. If this boat was built in 1971, I'd say the owner has maintained her well, even with a few dark spots. 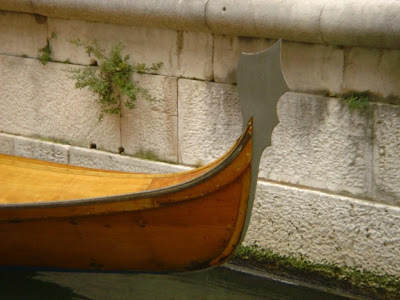 The ferro is a classic iteration of some of the "hacking blades" seen on parade boats during Regata Storica. I wonder if it's the usual hardware for this boat, or if it was left on after the Regata - I took these photos shortly after Regata Storica. Mmmm! If I ever get the chance to buy that boat, I just might.